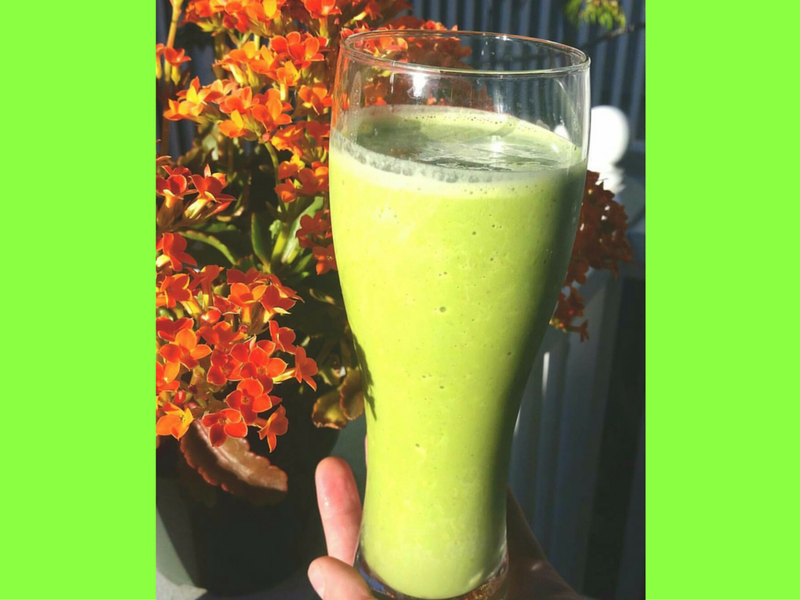 I hope everyone has been enjoying making that yummy Green Smoothie recipe! 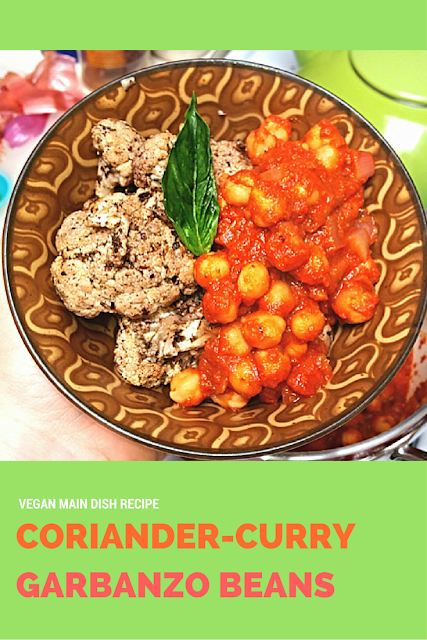 Today, I have a delicious and healthy Coriander-Curry Garbanzo Beans plant-based protein recipe for you. I created this not only as an economic alternative to more costly chicken and meat dishes, but also for more variety and a protein-rich meal that is low in cholesterol. The development of this particular dish has an interesting backstory. My husband lives with familial hypercholesterolemia, a genetic condition where too much cholesterol is stored in the body. Naturally, our body produces the cholesterol required for cellular structure and other bodily functions. Those with the condition my husband has tend to have excess cholesterol in their blood, which if not managed properly can lead to harmful cholesterol buildup and increase the risk of cardiovascular diseases. 1. Chop shallot and add to medium-size pot with olive oil. 2. Turn on heat to medium and let chopped shallot sweat until translucent and light brown. 3. 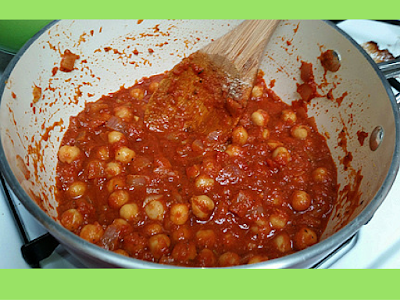 Once most of shallot pieces are translucent, add the garbanzo beans and stir 1-2 minutes. 4. Add tomato/marinara sauce, lower heat and mix. 5. Add all spices to the pot and stir continuously 4-6 minutes. 6. Optional: add fresh spinach and mix until leaves wilt and fully coated in mixture. 1. I suggest rinsing the garbanzo beans because usually canned vegetables, especially beans, have been sitting in a sodium-rich liquid. Rinsing the beans will allow you to better control the amount of salt you add to the dish and is helpful for those of you who may be cooking for someone on a low-salt diet. 2. 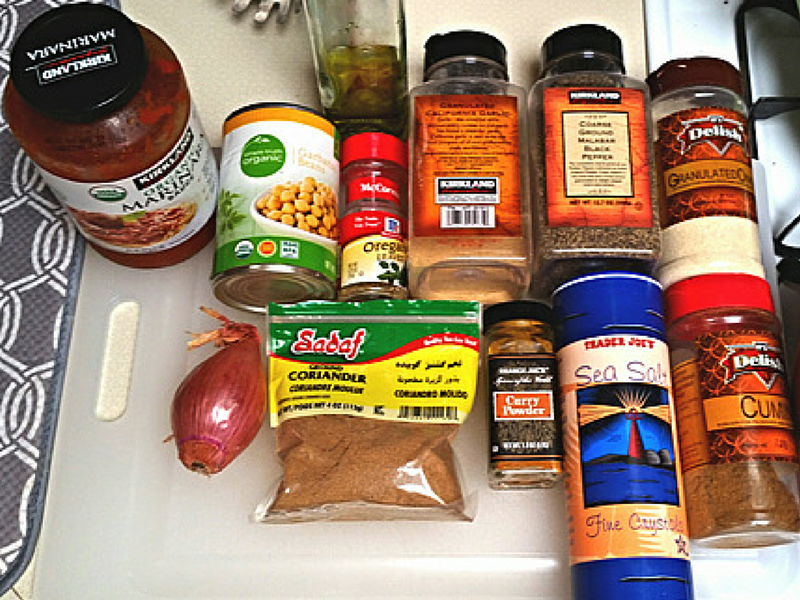 You can switch out the garbanzo beans for other beans. Kidney beans, for example, work well in this recipe. This rich and flavorful dish can be enjoyed on top of rice, quinoa, or any other grain and also pairs well with cooked vegetables or a fresh green salad. I hope you enjoy this recipe. Always feel free to reach out and let me know your thoughts! Dahlia Rimmon, Los Angeles, California, also known as Dahlia Eats on Instagram, graduated from Stern College with a BA in Sociology. She is now pursuing a Master's in Nutrition and Dietetics and Dietetic Internship at California State University, Long Beach. 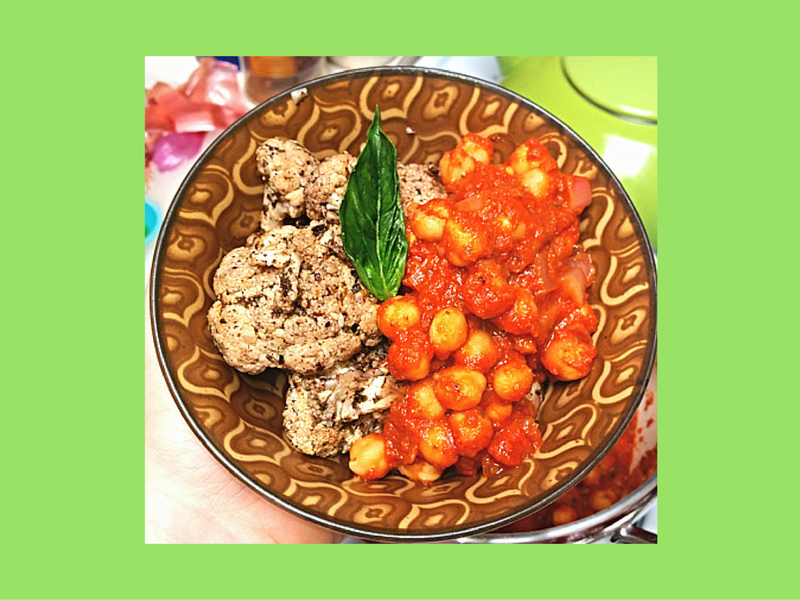 To add to that already interesting combo, Dahlia is engaging her culinary creativity and passion for good food by concocting new, easy, and healthy recipes to share with this blog's readers, in addition to her friends and family. In her free time, she enjoys hiking, Krav Mega training, gardening with her husband, and smoothies. Seriously, Dahlia is obsessed with smoothies as you will soon see in her upcoming MBE posts. FTC Disclosure: Recipe and photos are provided by Dahlia Rimmon of Dahlia Eats and opinions here are the author's. However, readers should keep in mind that no MBE blogpost is a substitute for advice by a qualified nutritional, medical, and/or psychological professional of your choice. No payment or other compensation was exchanged in connection with this post. See complete FTC Disclosure information that appears at the bottom of MommyBlogExpert's home page and at the bottom of every individual page including this one. This looks amazing. I am not vegan but I totally want to try it. I absolutely love curried dishes. Everything in this recipe seems so delicious and fragrant - definitely something I would not mind serving my family! That sounds delicious! I love garbanzo beans. This looks like a delicious and easy recipe to make. I will have to get the ingredients i need to make this recipe this weekend. Looks good! We're vegan at our house so this is right up our alley! 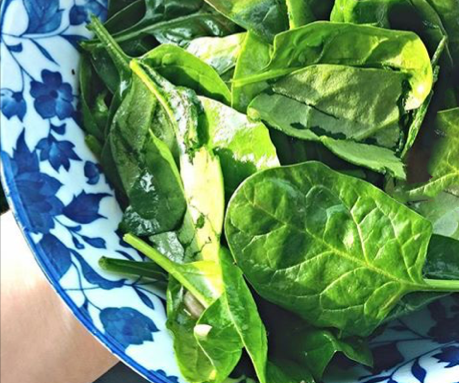 That spinach looks so fresh and delicious! 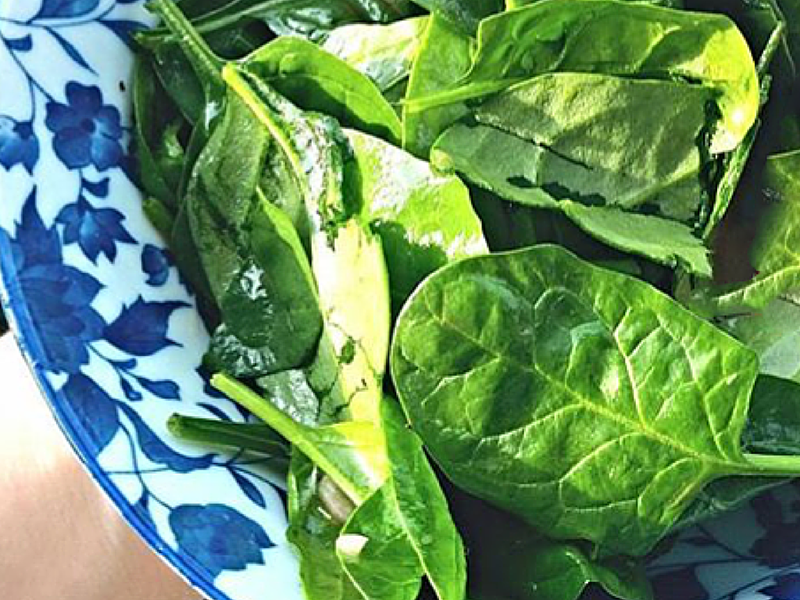 I'm definitely a sucker for some good green spinach. Although this whole dish sounds like a wonderful new culinary experience to try! I had never heard of this disease before. What a challenge. It's great to have these recipes for all who are suffering. Oh wow this sounds delicious - I hope it helps many who suffer with the same disease as well eat something delicious and good for them. You just don't even know how much I love chickpeas. Oh, and curry too. This has my name all over it. 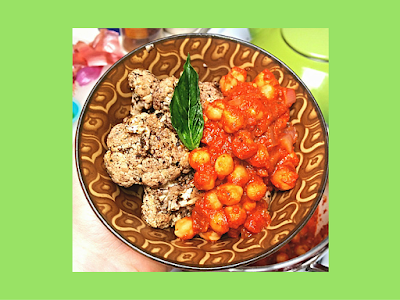 I am always looking for great healthy meals, this one looks awesome! I love Garbanzo beans so I am adding this one to the list. I love curry anything and we eat a lot of vegetarian meals. This is a must try recipe!! This looks like a recipe my husband would love! He likes making a variety of bean recipes so this would be a side dish he'd enjoy. This recipe sounds like it has a unique flavor. I know someone that is a vegetarian, perhaps they might like this. Try it and let us know how it goes!! I have a child who is a vegetarian and we are always looking for ways to get more protein into her. This recipe might fit the bill. Yes, beans have a ton of protein!